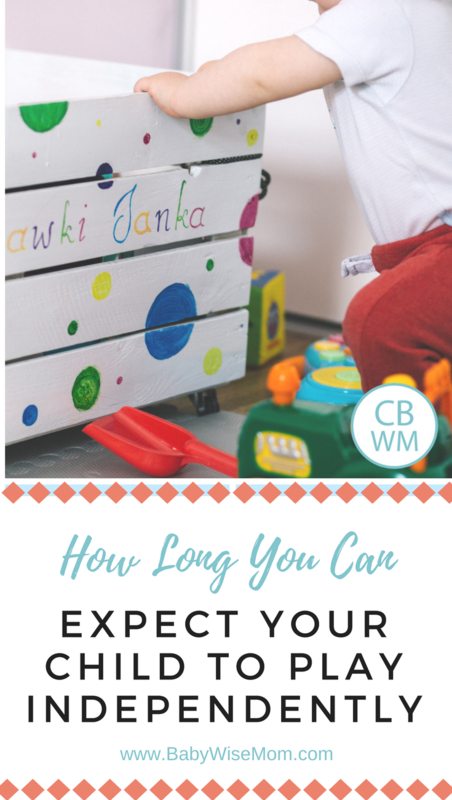 Independent Playtime Lengths: The amount of time you can expect your child to play alone each day during independent playtime. Independent playtime is when your child plays alone, independently, for a period of time in the day. There are many, many benefits to independent play, not only for your child, but for you also. It also says these are guidelines. Some days may be longer, some shorter. For example, say it is Saturday and you have a family thing to get to. 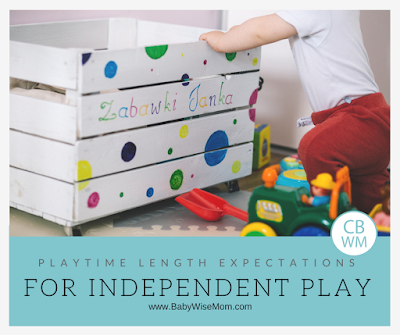 You can have a shorter than usually independent play so you can get to your family thing on time. You also don’t want to overuse it (read abuse it) and turn it into an all day thing. You also want it to be long enough for your child. As a note, I did independent play with Brayden only once a day because he didn’t love it. With Kaitlyn, we do it twice because she has always loved it. My other two daughters loved it, also. Brayden now loves it, and has since it became roomtime instead of playpen time. At nearly 3, he plays for 1-1.5 (usually 1.5) hours once a day. At 11 months, Kaitlyn does it twice a day. Her morning playtime is 20-30 minutes, depending on the amount of time before her nap. Her afternoon playtime is 40-45 minutes. She never complains about it, but I get her because I figure that is long enough for her at her age. Next Post Poll Results: What age did baby drop 4th nap (approximate)? At 7 months my son Joshua started experiencing Separation Anxiety, so for a while he couldn’t play by himself. It got better in a month, then a couple months later he had separation issues again. When he got over the phase, I reinstated the independent play time and he can stay in there for 30-40min. everyday. He’s 15 months now. I was reading in BW how this should be established by 2 months. My daughter is 3 months 2 weeks so I’m late starting independent playtime. I have 2 questionsRight now she can’t sit on her own and barely holds toys, so what would she do in a playpen? How do you distinguish naptime in the playpen from playtime? In BW it said it was good to let them take 1 nap in there and we use it whenever we travel for her to sleep in.Thanks! Kate,Don’t feel like you are late in the least. I would recommend you see the Independent Playtime post:Independent Playtime: https://www.babywisemom.com/independent-playtime/ It lists different ways I did independent playtime before Kaitlyn could sit on her own. You can also put a mobile or a stuffed animal for her to look at in a playpen. Keep in mind that for her age, the time is 10-20 minutes. She can likely sit for 10 minutes on her own and look around. You could also put a gym in the playpen with her.The way you distinguish nap time and playpen time is simply by what you do before each. Before a nap, you might read a story, you sing a song, darken the room, your voice is hushed, etc. You do your naptime routine. Before playpen time you are excited and you hand her toys. You leave the room as bright as can be. Babies are really smart. She will get it. Kaitlyn still naps and plays in the playpen. There has never been confusion. Thanks! I didn’t see that other post, it was really helpful. I feel the same way you did with Brayden – that if I’m not acknowledging her I feel bad. I know they’re fine on their own, but it’s still hard. You are welcome. I think over time you won’t feel bad about leaving your child to play on her own. Brayden asks for solo playtime and is sad when it is over now, so they really come to love that time to themselves. Hi, Don’t you have to keep getting alot of toys to keep a 3yr old interested? I have toys and refresh them now and then, but even with frequent playpen time, he will open up the mattress sheet and the board and the entire playpen will be a mess. Then when he is tired of being in it sometimes, he will throw his toys out, sometimes with cries, sometimes, he is just happy to wait for the timer to go off and clap his hands! so my playpen time never lenghtens. its always around 15-20 mins up till 15mths now. auy suggestions? You might be ready for room time rather than playpen time. My 15 month old daughter has done room time for months now. See the independent play post for ideas on that. My son (3 years) has playtime in his room also. OK – so what do you do when baby keeps standing up the whole time in independent play time and walking around his playpen?? I wouldn’t view that as a problem at all. I would just leave him be. Hi, I have a 9month old son turning 10mth soon. He has roomtime for his playtime after lunch and I supervise him. After that, I shower him as he’s perspiring and put him in his playpen (which acts as his bed for all naps and night sleep). Then I sit next to him reading my books while he plays with his bear in the playpen. After a while, I’ll walk out of the room leaving the room door open and my son would just be in his playpen alone, either playing with his pillow or bear or just lying there. After a while, he’ll fall asleep for his afternoon nap. Can I consider his alone time before nap to be independent playtime? If I put him into his playpen for his independent playtime and walk out of the room, he’ll cry and scream as he’s enjoying the roomtime during his playtime.If the above is not considered independent playtime, how should I start introducing it again and should I just let him cry in his playtime until he settles himself down to play independently? Hazel,You want to look at your goals for independent play time. Part of the goal is to have your child follow instructions and do what you have asked him to do. You can take this two ways:1-is to just continue on and work on him doing it when told later on. The problem with this method is that they just get less compliant as they get older.2-have official independent play time. I personally wouldn't count what is happening as independent play. You want him to be able to play with toys alone so he can learn to problem solve on his own. You don't want him to just play with his bedding for playtime.I would start with 5 minutes. Set the timer. When it goes back in, look all happy and excited and ask him if he had fun, etc. See the blog label "independent playtime" for more on this. Once he is up to 5 minutes happily, slowly increase the time to your desired length. thanks for posting this. My babe had been doing 10 mins 2x a day @ 3-4 months, now that he is 5 & almost an independent sitter I've been extending it slowly. He's at 13mins. I was just stopping to check to see if that was too much or too little. Thanks! Is it crucial to do it the same time each day? We've always done some sort of independent playtime but it's never been at hte same time (atleast during the afternoon hours). and I never really do a set time either, just do it till he starts fussing. Generally that's about 20 minutes, but sometimes he will go longer so I don't mess with him if that's the case. He's almost 5 months. Linds, it isn't crucial to do it at the same time each day. It is helpful to do it at a time when baby is more pleasant, but baby can be pleasant at many different times.It is crucial to do it so that mom, not baby, decides when it ends. I would take note of how long he can do it before fussing and get him a minute or two prior to that so he doesn't learn that fussing gets him out of independent play. You can also use a timer so he learns the timer, not fussing , determins the end of independent play. I have a question about independent play time. I used to do it with my son on a play pen until he got too old (about 12-14 months… I cannot remember exactly). I then moved him to do 30 minutes sitting at a table made for his age with toys I would give him. He now seems to getting too old for this (he is 19 months old).I am afraid of leaving him in his room at this age unsupervised… I am trying to figure out what else I could do for true independent time. He can entertain himself well in other scenarios (ie: free play time etc..) so I know he can play independently. I just want him to continue with structured independent play time… any suggestions? Yadi, I encourage you to do roomtime. If you feel like his room isn't safe enough, see if there is another room in your house that is. What I did with my oldest is sit in with him and watch him for a few weeks so I could make sure the room was totally safe. If you just don't feel good about the room, do the playpen. Some moms do the playpen until age two or beyond. You could even get one of those octagon shaped gate systems to set up if you wanted it larger than a playpen. So you abandon your kid in their room or playpen? Why can't they just play alongside you as you go about chores? Saskia+Joel,You could use a baby gate, or try just telling her to stay in whatever room you want her to stay in. GMPMama,My kids spend lots of time with me throughout the day–including with chores. An hour is hardly an "abandonment." Also, many experts (and the AAP) recommend teaching your children to play independently. My children love this time. It is great to get some time alone. Hey there! Your blog is amazing and has been super useful this past year…thank you for creating such a wonderful resource. Question for you. My son is 14 months old. We have followed most of Babywise since he was born but I never implemented Independent playtime. What would you suggest for starting it now? My 7.5 month old has about 20-30 minutes of independent play in the morning when she's well rested, to allow me time to eat breakfast and get ready. She does just great.Later on she'll play in the same room as me while I work (I'm a freelance graphic designer) and she'll be happy for a good hour or more as long as she can see me. Sometimes she plays in her crib afterward while settling down for her nap.This seems like a long time, but she just LOVES to explore and do things on her own. She actually resists help. But does that seem like too long for her to be playing on her own? She's my first, and I sometimes freak out about neglecting her. Hey! I feel like I've been asking a lot of questions lately… Sorry about that. I just feel like you have a lot of wisdom when it comes to little ones. My question is about independent play time. Right now at 14months, lo has about 30-45 mins of playtime in her pack-n-play. She doesn't fight it and I think she really enjoys the boundaries… I know I do. Lol. I think she is working on dropping the first nap, hard to tell though since she is cutting 4 new teeth right now, so I'll be lengthening her IP soon. Anyways, how old does she need to be in order to have independent play in her bedroom? Also, should I be completely out of sight during this playtime even if it's in the pack n play? Thanks so much for your much appreciated advice! Yes, you should be out of sight. You can start her just being in her room anytime that you are comfortable with it. She is old enough. I had some at that age and some much older. And I am happy to help! Hi Valerie, thank you so much for your blog! I am new to Baby Wise and your blog is so very helpful! My son is almost 10 months and I am thinking of starting IP with him soon. Is it okay to have his IP time in his crib rather than a play pen or something else? I worry about using his crib for anything other than sleep, but his room is too small for an extra play pen and I don't feel comfortable just doing room time at this point. Do you think using the crib will negatively affect sleeping in the crib or should it be okay? I have the 2012 edition of Baby Wise but it barely mentions playpen time, so I'm trying to learn more from your blog. My baby is extremely clingy (and has been since birth) and I really want to start helping him feel okay when Mommy isn't right there holding him or playing with him all the time.Thank you! Hi Erin–welcome! -it should be fine. Babies are smart. Just keep things different–like lights on, blinds open, and maybe some music and/or books on tape.